Original Story: The Register-Guard (6.28.17). The Lane County Board of Commissioners unanimously approved an order Tuesday to negotiate with the city to buy the vacant Eugene City Hall site and to sell to the city the county-owned butterfly parking lot immediately west of the existing county courthouse. Their vote followed a Monday evening City Council vote approving the same agreement. The agreement commissioners approved Tuesday expires Sept. 27 and would need to be extended if the judge hasn’t ruled by then. Beyond legal issues, big financial questions remain about how both the proposed City Hall and new county courthouse would be paid for. The city would need to develop a design, cost estimate and sources of money for a building on the butterfly lot. Lane County officials, meanwhile, hope for $5 million from the Legislature in the waning days of the current session and eventually up to $50 million in state money to help pay the estimated $200 million cost of a new courthouse. But receiving the $5 million this year is far from certain. The county probably would ask local taxpayers to fund most or all of the work not covered by state money. The city-county agreement caps a year of public meetings and private negotiations over the exchange, which they began exploring last summer as cost estimates for a long-planned new City Hall on the site of the old one soared past initial estimates. If the swap is consummated, Lane County would pay the city just shy of $4 million to buy the vacant former City Hall block. The city would buy the butterfly parking lot for $1.88 million. 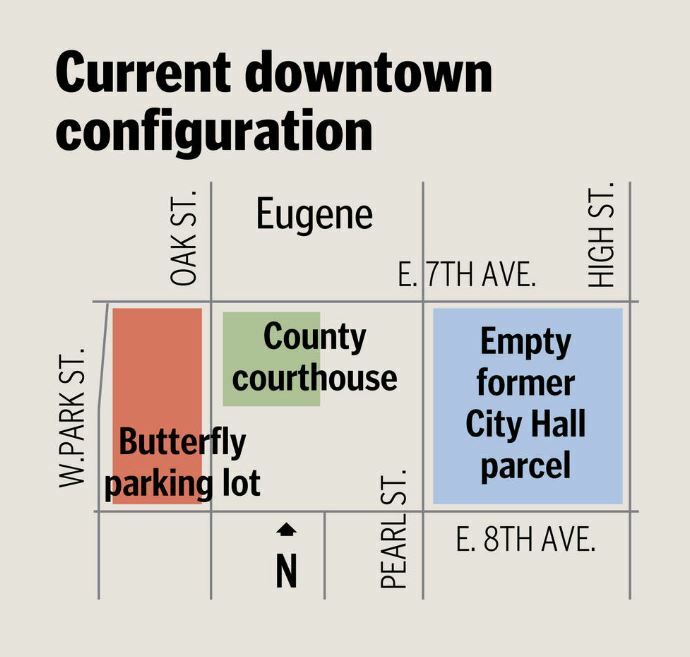 The county then could build a new circuit court building on the old City Hall site, while the city could build the new City Hall on the northern half of the butterfly lot. The two entities would partner on a permanent structure for the Lane County Farmers Market on the southern half of that lot. Eugene Mayor Lucy Vinis praised the agreement Tuesday afternoon, standing in the center of the farmers’ market with county commissioners and city councilors, law enforcement officials, Lane County judges and business owners. The land sale prices are based on real estate appraisals jointly paid for by the city and county. The purchase and sale agreement between the city and county is separate from a proposed “intergovernmental agreement” between the two entities, meant to guide how the city and county would cooperate on a range of issues from support of the Lane County Farmers Market to the use of the existing Lane County Public Service Building and courthouse. 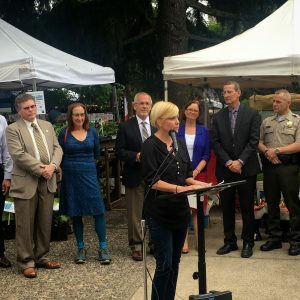 Eugene would spend up to $4.5 million for farmer’s market improvements, under a draft of the agreement, while the county would contribute up to $940,000 in cash or in-kind contributions, with a minimum of $500,000 in cash. Under another point of the agreement, the county would give the city an option to buy the existing county courthouse at fair market value for a future phase of the City Hall project, once a majority of tenants have moved into the new courthouse. An additional point allows the city to maintain its offices rent-free inside the Public Service Building for the next three years. The city leases space inside the building for its city manager and city attorney offices.